Apple has scheduled a Special Event on September 12th in Cupertino, California. The company will be launching new hardware products including new iPhones, iPads, and the new Apple Watch. There are already several leaks about these upcoming Apple devices. The Apple Watch Series 4 is expected to come with an edge-to-edge display with bigger screen size. All these upcoming Apple devices will be coming in a new variant of Gold. Talking about the 2018 iPhones, the company is long rumored to launch three new iPhones. The revolutionary iPhone X will be getting two successors – Apple iPhone XS and Apple iPhone XS Max. As seen with the earlier launch s-variants, we expect the upcoming iPhone XS and iPhone XS Max to continue with the similar as the original iPhone X. While these two devices will continue to come with edge-to-edge OLED notch display, the third devices is said to use LCD panel. The recent leaks suggested the third and cheaper iPhone to be named as iPhone 9. It will be coming with a bezel-less LCD display and will be slightly less powerful than the other two iPhones. However, it will be the first ever Apple iPhone to come with dual SIM dual standby support. Now, the leaked China Telecom’s teaser image also confirms the dual SIM feature with dual 4G support. From the above image, we can see the dual SIM card slots along with the power button on the right edge. 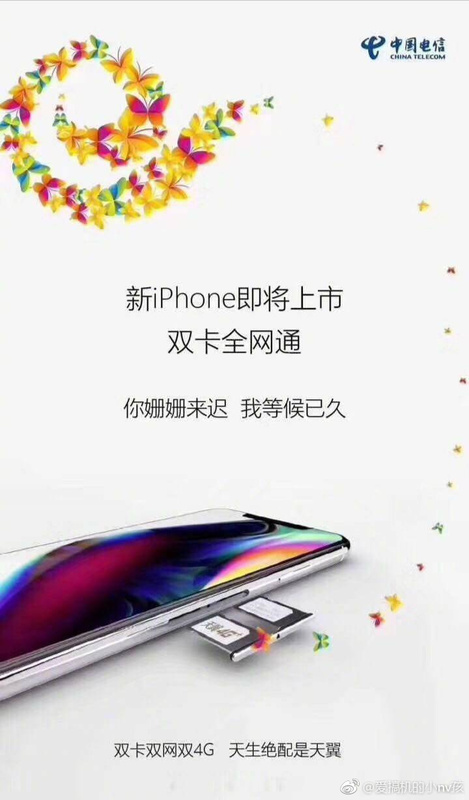 Another Chinese telecom company China Mobile also posted an illustration hint the dual SIM Apple iPhone. The dual SIM iPhone will be mostly limited to a few Asian markets like China, India, and Indonesia. Stay tuned on Phone Radar for more details!